So realistic, Looks like a real Scary Hornet!! The first interchangeable rod and hard wire cat toy in the world! The Wasp Bug Prey is fixed to a stiff but flexible wire and a female fixing on the other end to attach to the Bug hunter rod. Ave 50cm long plus Bug. If your cats like to chase scary Wasps & Bees , this is the Bug for them that wont sting! With the Bug Hunter rod, you can put life into the bug so it can, fly or dart around the room, or garden. Your cats' speed and grace will amaze you as they dash around trying to capture the prey! Made of 100% genuine British Deer hair and feathers. The hair is a by-product from free roaming, outdoor reared herds from the UK and are protected under British Animal Welfare Laws and The British Deer Society (BDS). Excellent realistic size approximately 6cm long x 3cm high in body plus wings and legs. PLEASE NOTE - The legs are made from natural real feather steams so are a delicate part of the toy for decoration purpose and can break off. Colour - Yellow & black. Individually handmade. 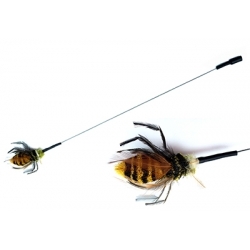 Add a bit of variety to your Bug Hunter rod with this fun attachment! To complete a cat's natural hunt, catch, kill, eat cycle, use the Purrs Rod toys as hunt/chase exercise toys and some real feathers or the Purr Purrize toy for the kill instinct and cat treats for afterwards to complete the cycle.